The Wobblies emerged more than a century ago, a revolutionary, anti-capitalist union that shook up the nation’s industrialists, including Oregon’s timber barons. Their political descendants no longer toil in logging camps on the American frontier. Now they’re behind the counters of a beloved fast-food chain in Portland, up to their elbows in burger grease, marionberries and Walla Walla onion rings. Their union drive has already won a historic victory, when workers at Medina’s shop voted in April to form a federally recognized union — the first in more than 40 years among fast-food employees nationwide. Now the Wobblies dream of organizing the entire Burgerville chain, which stretches from Corvallis to Centralia, Washington. A second store will vote Saturday and Sunday. The budding campaign has sought to vilify a homegrown company that has long basked in its reputation for locally grown food and comparatively high perks that have helped retain workers longer than its fast-food rivals. It’s also restored the union, formally known as the Industrial Workers of the World, to regional prominence after a century of apparent obsolescence. And it’s created a test case for the labor movement and whether it has a reinvigorated place in America’s service industry. Can a labor group from early in the past century find resonance in a radically different Oregon economy, when jobs are plentiful but wages are tight and housing is scarce? Their quest is quixotic, the vision more than ambitious. Yet it’s elevated the possibility of organizing an industry traditionally plagued by low wages and high turnover. Publicly, Burgerville has thus far remained cautiously open-minded. “For us, it’s an opportunity to explore a new way of working together,” said Beth Brewer, its director of operations. Here’s what the union wants from the company: a $5 an hour raise, health care for all workers and schedules set two weeks in advance. They’re also asking for paid holidays, family care and for the chain to stop checking employees’ immigration status. That’s radical, for the fast-food industry. Many workers earn barely above minimum wage. Most leave or lose their jobs within a year. They’re on the fringes of the American work force and there, at least, the Wobblies find some resonance with their heritage. Since its 1905 founding in Chicago, the IWW has carved an uncommon path within the American labor movement. It envisioned workers seizing control of their industries, and, unlike other unions, trained a relentless focus on those cast into low-wage professions. Immigrants. Women. Itinerant and unskilled workers. The union’s presence in Oregon and Washington throughout the early 1900s left an indelible mark. 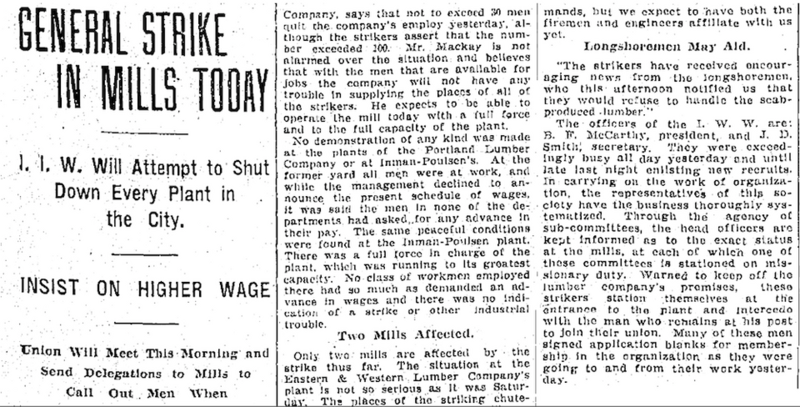 With Portland a center of its organizing, the Wobblies waged strikes in the city’s sawmills and shut down logging camps. Laborers subsisting on seasonal work flocked to the union. 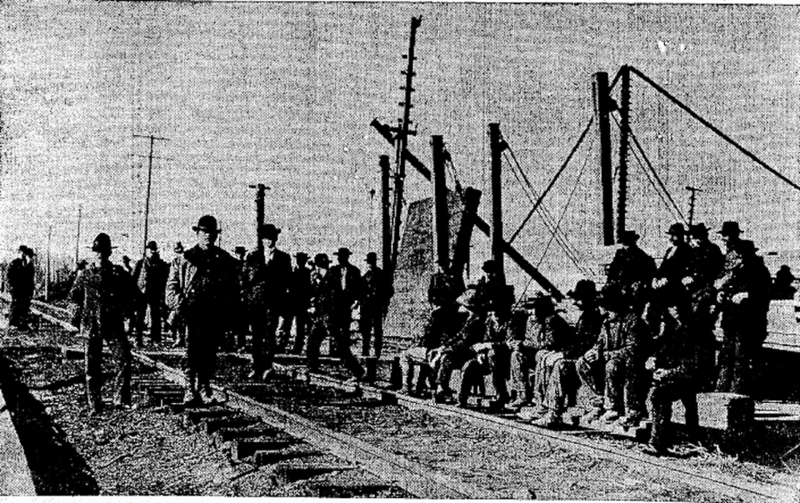 The union had a penchant for mobilizing thousands of these itinerant workers for demonstrations and displays of solidarity. Throngs of raucous men clashed with police in the streets from Spokane to Sheridan. “Every city in the Pacific Northwest was afraid of them,” Hodges said. But their notoriety lasted little more than a decade. Government crackdowns and communism, which emerged as a political alternative to worker rabble-rousing, nearly snuffed the Wobblies after World War I. Their ranks steadily dwindled to a fraction of the 100,000 members the union boasted at its peak. Decades later, young radicals amid the upheaval of the 1960s rekindled the revolutionary spirit of the union and staved off its extinction. Protests against the World Trade Organization in the late 1990s injected a fresh new wave of support nationwide, said Ryan Gaughan, a Portland delegate of the union. “We have a belief that workers have the ability to radically transform their workplace and by doing so radically change society,” said Gaughan, who joined the union in 2001. Polls and studies show public support for unions is the highest since 2003, with millennials embracing the idea more than any other demographic. News reports and TV images of teacher-led walkouts and strikes for higher wages have served as a recent — and vivid — reminder of the power of worker-led movements. Meanwhile, a five-year national effort to increase the fast-food minimum wage to $15 an hour, separate from the Burgerville union drive, has led states to adopt pay increase laws and cast a spotlight on the millions of people who struggle to make ends meet. Years before the “Fight for 15” became a national wages rallying cry, the Wobblies set their sights on food-service workers. Union members at Starbucks in New York City began organizing their fellow baristas in 2003, eventually growing into a national campaign against the coffee giant. Later, workers at Minneapolis-area Jimmy Johns attempted to organize a union drive. Both campaigns drew national headlines but had limited success. In Portland, where the union’s membership hovers in the low hundreds, the Wobblies in 2015 began to look for opportunities at a handful of local restaurants and companies, which also included New Seasons, Grand Central Bakery and Papa Murphy’s, Gaughan said. The conditions were ripe: A progressive city with people partial to unionized workers. A metro area where wages hadn’t kept pace with meteoric cost-of-living increases. Ultimately, the union’s efforts coalesced around Burgerville. The Vancouver-based chain, which employs 1,500, has deep ties in the region. Its parent company, The Holland Inc., began as a creamery founded by Dutch immigrants in 1926. 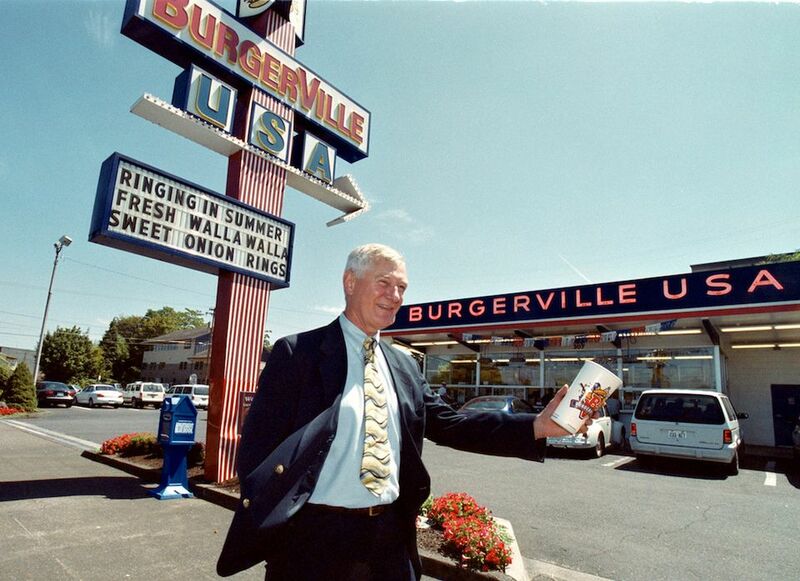 The first Burgerville opened on Mill Plain Boulevard in 1961. Over the years, the company has cultivated an image aligned with the region’s values. 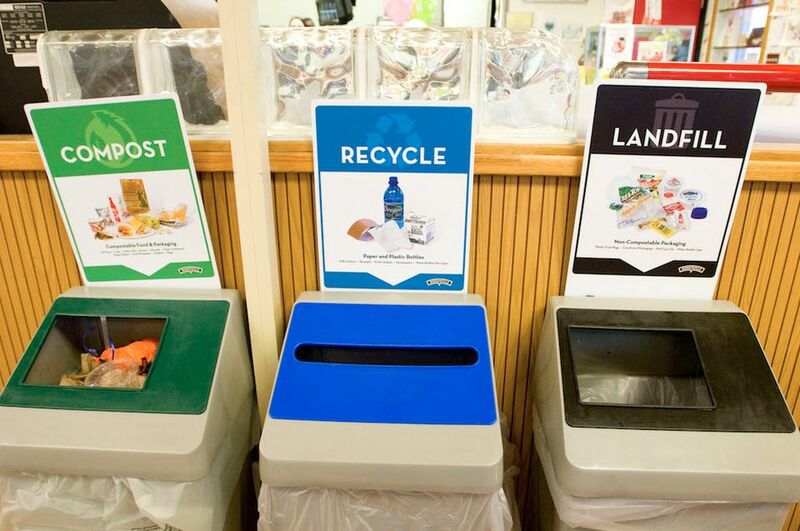 It recycles cooking oil into biodiesel and purchases wind energy credits equivalent to the power used in its corporate offices and restaurants. It sources food from local farms and dishes seasonal items such as asparagus spears and chocolate hazelnut milkshakes. But some of those paid an average hourly wage of $11.70 to sling Tillamook cheeseburgers or to wipe down the plush booths and red barstools weren’t feeling it. “Those values were not reflected in workers’ paychecks,” Medina said. 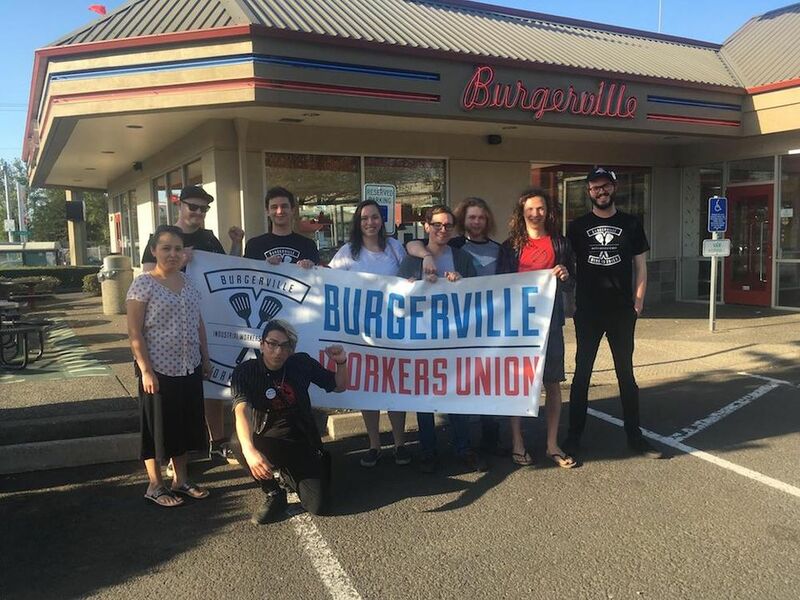 After months of quiet planning, the Burgerville Workers Union officially launched in April 2016. Emmett Schlenz, a union spokesman, said six of the company’s 42 locations now have publicly active unions. They’ve held picket lines and led walkouts. A Burgerville boycott campaign has garnered the backing of multiple labor unions as well as some progressive civic leaders and elected officials. 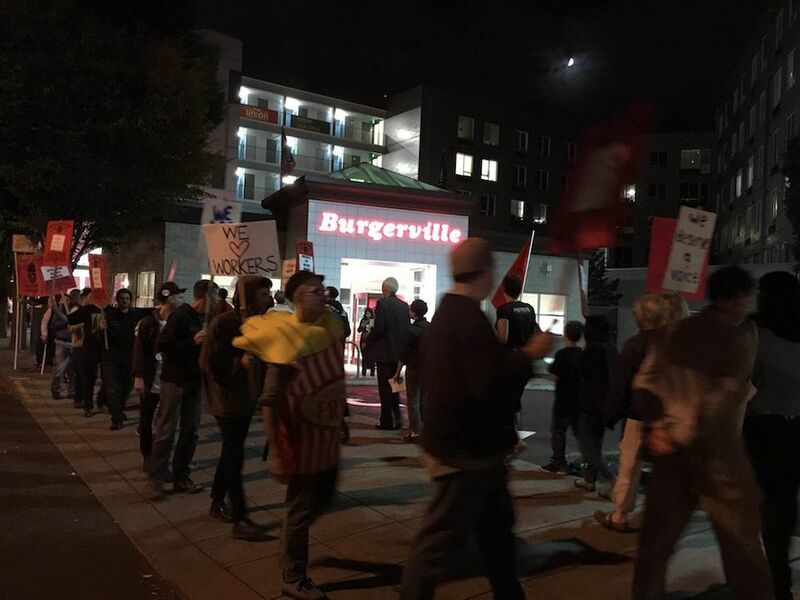 Last month’s election victory, overseen by the National Labor Relations Board, legally requires Burgerville to negotiate a contract with workers at the 92nd and Powell shop — something the company had refused to do voluntarily. The campaign has tried to cast the company as a peddler of poverty wages and hostile to pro-union workers. Some employees have criticized wretched working conditions and erratic hours. The company tells a different story. Burgerville’s turnover in 2017 was 71 percent, half the industry average of 140 percent, according to figures it provided. The average worker lasts 29 months, which the company says is a quarter longer than its competitors. Burgerville also offers family health care plans for employees who work at least 30 hours a week, paid sick time and educational stipends. That exceeds benefits provided by other fast-food chains, according to industry analysts. “We are proud of our relationship with our co-workers, and we will continue to provide a fair, positive work environment for all,” said Brewer, the operations director. Both sides will soon be at the bargaining table, though a date has not been finalized. The company declined to comment on the Wobblies’ wish list but said it would bargain in good faith. Companywide sales reached $79.1 million last year, or more than $1.8 million per store, according to data from researcher Technomic. That’s up 6.2 percent from the previous year and higher than the region’s Wendy’s and Taco Bell franchises and about the same as Chipotle. “All indicators point to favorable sales and profit-related conditions,” said John Gordon, a restaurant industry analyst with Pacific Management Consultant Group. Based on those figures, Gordon said the company would have some wiggle room to negotiate with the union without blowing a hole through its bottom line. But he added that an immediate $5 hour raise for workers seemed impossible. Meanwhile, the Burgerville Workers Union is plotting its next steps. Employees at the company’s Gladstone store will hold a union vote Saturday and Sunday. It remains unclear how many stores the Wobblies can successfully unionize. But the momentum building locally may galvanize those organizing in other parts of the country, said Wilma Liebman, a former chair of the labor relations board under President Barack Obama and now a law professor at New York University.